Get ready to put your brain through some intense mental gymnastics, for the good people at King have got a delicious treat for you. Candy Crush Saga has everything you have come to love and expect of the match three puzzle genre, and a whole lot more as well. Are its visuals bright and as fantastically colorful as the best of them? You bet they are! Is it simple to learn, easy to play, and challenging to master? The answer is a resounding yes, yes and yes respectively. Does it have variety? More than you would ever expect to see from a mobile game. 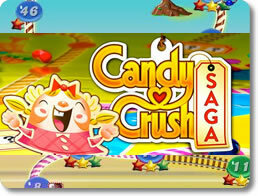 In Candy Crush Saga, you'll be amazed by how much you can accomplish with only a handful of sugary delights. What separates Candy Crush Saga from the crowded market of mobile puzzle games? The answer is simple and twofold: strategic depth and level variety. Candy Crush Saga limits how many moves you can make, so it's up to you to determine what the most efficient and tactical matches will be. Play smarter, not faster! Score as many points as you can before time runs out. Get as high a score as you are able to in as few turns as possible. Remove all jelly from the board before you run out of turns. Collect all the ingredients scattered across the board. Things may seem as hard as a lollipop for you in Candy Crush Saga, but don't fret just yet. Depending on how you group your confections together, you can create special candy treats that can cause all sorts of spectacular mayhem when they're activated. Making and using special candy is the key to seeing this saga to its sweet end. Position five candies together into an L or T-shaped formation to create a Wrapped Candy, which unleashes a wide explosion. Match four sugary treats together to form a Striped Candy. Striped candies can wipe out entire rows and columns in one fell swoop. Group five confections together to make the mighty Color Bomb, and use it to crush all matching candies of your choice. Combine special candies to invoke a sugary apocalypse the likes of which you've never seen before! If making special candy isn't enough for you, then you can further swing things to your advantage with a variety of boosters. These goodies may be in limited supply, but they can really save your taffy if you find yourself in a jam. Smash whatever candy you like with the Lollipop Hammer. Swap any two candies around with the Free Switch. Start any level with Stripe Candies or Color bombs already on the board. Turn any treat into a Striped Candy with the Striped Brush. Summon the UFO to put some Wrapped Candy on the grid. Candy Crush Saga is far and away one of the biggest, brightest and most popular mobile games out there for good reason. It's just as addictive as the tastiest sweets you knew from your childhood, as hard as the biggest jawbreakers you ever laid your tongue on, and just as free as all those treats you smuggled away from your best Halloween outings. With over 300 levels to complete, it will also last you a very long time. If you consider yourself a connoisseur of puzzle games, then you definitely owe it to yourself to sharpen your sweet tooth and see what all the excitement for Candy Crush Saga is about. It's amusing to picture all the various match three puzzle games as an assortment of blood-splattered warriors fighting each other for dominance while loudly proclaiming, with their swords in hand, that 'there can be only one!' It's even more amusing to picture Candy Crush Saga as standing victoriously on top of the pile, waving its bloodied lollipop-shaped war hammer around like a madman. While the reality of the situation was not nearly as violent or full of spectacle, that is still kind of what happened. Candy Crush Saga is simply put one of mobile gaming's greatest phenomena due to its sheer popularity. It definitely stands out from the crowd in more ways than one, and while the game is not without its share of problems, it's easy to see why it has become such an iconic and widespread app. At the very least, Candy Crush Saga definitely gives itself a visual identity. The game takes place in a bright Candy Land-inspired world populated by all manner of confection-themed people and animals. The visuals are colorful and there is a nostalgic charm of sorts to be found, especially with the characters, all of whom are modeled to look like paper puppets with their thumb-tacked limbs, rotating joints and propensity for being waved around on a stick. However, the game does admittedly go a little overboard with it at times. It seems like it was designed to appeal to very young children, but it's blatantly clear that they're most definitely not the app's target audience if its difficulty and freemium features are anything to go by. The protagonist in particular, Tiffi, has too many cuteness tropes baked into her design that she ends up looking more creepy than endearing. She most certainly won't be winning any popularity contests anytime soon. However, one can't fault King too much for going in this direction. They accomplished what they set out to do and made an inspired world of sweets, which is all anyone should honestly expect from a good developer. Critics of the match three genre are likely to say that once you've played one match three game, you've played them all. While it is sadly true that most are largely just copying Bejeweled, Candy Crush Saga is thankfully not among them. Matching may still be the name of the game, but King was smart enough to add a lot of new stuff, giving their app its own distinct flavor. For one thing, there are multiple types of levels to tackle. Timed levels feature the most traditional puzzles you'll deal with in the app, for they require you to reach a certain threshold of points before the clock runs out. Sharp eyes are necessary to beating them so that you can quickly find matching rows of candy one after the other. However, all the other levels require a more methodical approach. You have a limited number of moves at your disposal to finish your designated task, which can include gathering ingredients, clearing the board of jelly, or just simply racking up enough points to complete the puzzle. 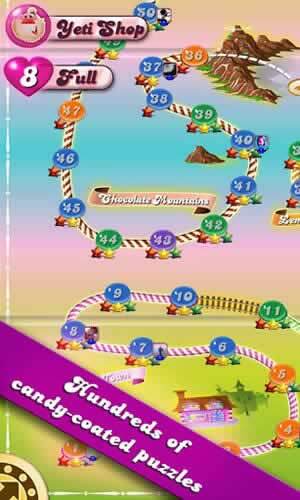 You need to make wise decisions in these levels, because simply matching every three confections together is just going to waste your precious turns. 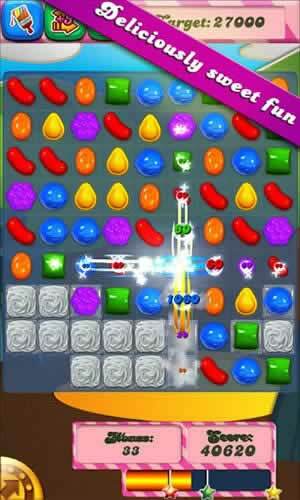 With these puzzles, Candy Crush Saga is a much slower-paced game than its competitors. Making the game even more strategic are the various special candies that you can create. When activated, they tend to cause a lot of damage to the board, clearing out whole rows of candy or blowing up all treats of a specific color. Special candies typically require you to match more than three together in sometimes unconventional ways. For example, if you want to make a Wrapped Candy that has a large explosion radius, you have to match confections together so that they come in the shape of a T or an L. Special Candies can also be matched together, which will in turn cause their effects to combine in some really spectacular ways. You won't be able to pull these combos off a lot, but when you do, you can usually consider it an automatic win. Overall, Candy Crush Saga does an amazing job at putting a lot of new spins on an otherwise old formula. The match three gameplay is immediately familiar, but the different puzzles and the emphasis on tactical gameplay help make it feel constantly fresh. Furthermore, the gameplay evolves the further on you go, throwing more and more obstacles your way and using increasingly more bizarre board designs to keep you on your toes. You'll oftentimes find yourself having to break through barriers of frosting and chocolate, working your way around gaps in the board, or having to match candies in multiple isolated grids at the same time. Candy Crush Saga never stops upping the ante. Unfortunately, that has its downsides. Despite its overly cute appearance, the app is very hard. One could say it's unfairly so a lot of the time. Making strategic matches, forming special candies, and blowing up entire rows of sugar at once is all well and good, but you just have no real control over when these can be made available. Sometimes, the conditions needed to make special candies just won't come up, and when they do, there's no guarantee that you'll even be able to use them anyway. It gets really bad on grids that are especially narrow, which limits how candies can be arranged and matched up at all. It's not unusual to get stuck on a certain level for hours on end. Like it or not, your success in Candy Crush Saga is in large part going to depend on how merciful the random number generator is feeling towards you. The game's difficulty is not very consistent either. It tends to jump all over the place, with nigh impossible levels getting followed up with insultingly easy ones with alarming regularity. Luckily, the game does have the decency to at least mark some levels on the map as hard, so you'll know what you're in for ahead of time, but even 'normal' stages can get highly frustrating. In order to combat that issue, the game lets you bring along some boosters just in case the going gets tough. These include things like extra turns, a Lollipop Hammer that can crush any candy of your choice, and things that allow a level to start with a special candy. These are nice, but they're not always enough. Conflating matters is that when they fail to turn things to your favor, then you lose them forever. Don't expect the app to hand them out generously either; if you want to keep a healthy stash of boosters on hand for emergencies, then you'll either have to spend hard cash on them, or else hassle your friends. Candy Crush Saga has a number of glaring issues that simply can't be ignored, but at the same time, it's also a remarkably well-made game with a lot of thought and creativity put into it. It takes what has historically worked in the match three puzzle genre and gives it some much needed innovation with its assortment of unique puzzles and power-ups. It all adds up to make an experience that's never repetitive and quite fun, even if it will also make you want to chuck your phone out the window. If you're willing to take it slow, then it definitely deserves a place on your library.